Michael D Higgins was elected as Ireland’s ninth President in 2011. A passionate political voice, a poet and writer, academic and statesman, human rights advocate, promoter of inclusive citizenship and champion of the arts within Irish society, he has served at almost every level of public life, including as Ireland’s first Minister for Arts, Culture and the Gaeltacht. Throughout his life, Michael D Higgins has campaigned for human rights and for the promotion of peace and democracy in Ireland and many parts of the world. He has demonstrated a strong commitment to education throughout the course of his career and is focusing his presidency on youth and education while promoting Ireland abroad and reconnecting with the Irish diaspora. He was elected an honorary fellow of the College in 2012. Dr Kauppinen was CEO of the Finnish Association of the Deaf for 30 years, General Secretary and President of the World Federation of the Deaf (WFD) and served as the permanent WFD representative to the United Nations for 20 years. She still continues to serve as an expert for the General Secretariat of WFD. She has been a major inspiration to deaf communities internationally, and an articulate and intelligent ‘voice’ on the need to explicitly state the human rights of deaf people at national, European and global level, all the while decrying the lack of opportunities for education and training, the under-employment of deaf people, and the lack of recognition of signed languages as ‘real’ languages’. She has supported the development of deaf self-advocacy in Ireland and was a key supporter of the move to establish a Centre for Deaf Studies at Trinity College in 2001/02. A Dominican sister, Margaret Mac Curtain is a distinguished Irish historian, human rights advocate, feminist, social activist and writer. She has made a major contribution to social issues since the 1960s, including spearheading the publishing of women’s history in Ireland in the 1960s. Though retired from academia, she remains at age 83 an inspiring figure demonstrating an extraordinary ability to tackle controversial and difficult issues in a caring and compassionate manner. Dr Mac Curtain was a recipient of the Women’s International Center Living Legacy Award in 1997, joining a distinguished group of recipients including Mayo Angelou, Jehan Sadat and Mother Teresa. Born in Dublin in 1939, John Sheahan is a distinguished musician and composer as well as poet and wood sculptor. He has been a member of The Dubliners for 48 years and is now the only surviving member from the early days. His best known composition is “The Marino Waltz”. Many of his works have been recorded and performed by both classical and traditional artists. Over the years, he has been in demand as a studio musician, and has contributed to the recordings of such artists as Kate Bush, Rod Stewart, Dolly Parton, Terence Trent D'Arby, and The André Rieu Orchestra. His recent TV documentary, "John Sheahan - A Dubliner" was received to great acclaim. The musicology of John Sheahan and The Dubliners is legendary and their contribution to Irish folk music has been immense. 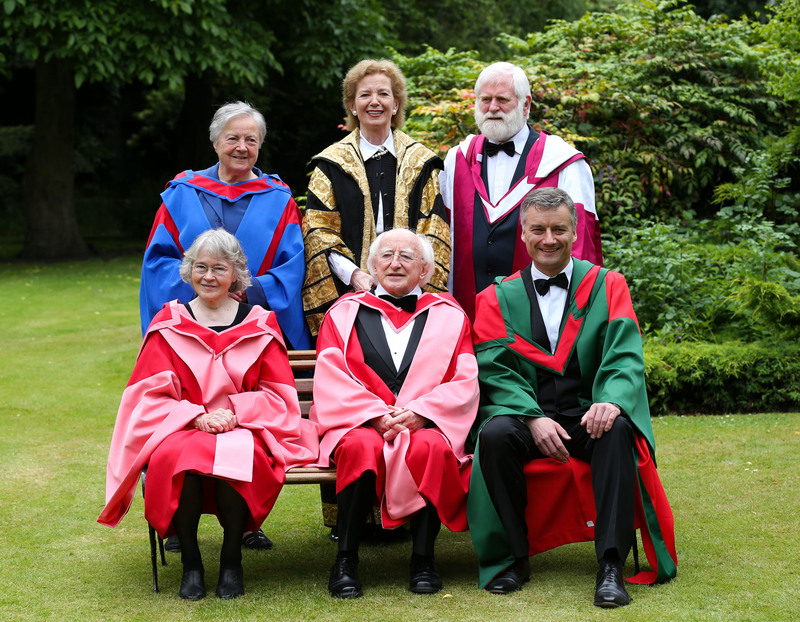 President Michael D Higgins has described The Dubliners as ambassadors for Ireland and, through their recordings and performances across the world, they have generated enormous recognition for Irish musical heritage and affection for the city of Dublin. 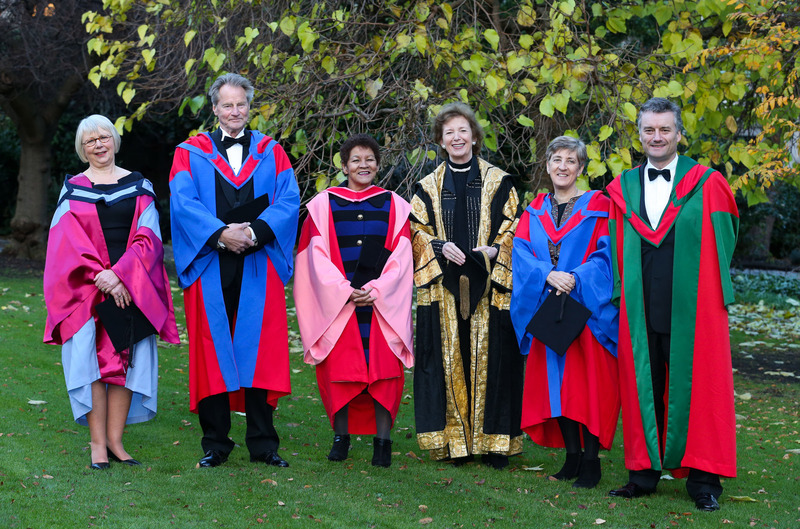 To mark Dr Margaret Mac Curtain's award of an Honorary Doctorate on 28 June, Áine Lawlor held an interview with Dr Mac Curtain on Monday 7 October 2013 and explored her life and work. Dame Lynne Brindley has had an illustrious career in British university libraries and is currently visiting Professor of Knowledge Management in the University of Leeds; from 2000-2012 she was chief executive of the British Library. She has been instrumental in transforming the concept of Library from passive archive to dynamic contributor to research and the wider education environment and realising the potential of digital formats. Her contributions were recognised in 2008 by the award of the DBE. She has offered continuing support for the College Library’s role as a Legal Deposit Library for the UK. It is fitting to award an honorary degree to this distinguished librarian in 2012, the year that the Old Library is celebrating its Tercentenary. A former resident of Goldenbridge Institution, Ms Buckley was one of the first to go public on her experiences. For more than 25 years she has campaigned tirelessly on behalf of other victims of institutional abuse. She is a co-founder and director of the Aislinn Centre in Dublin which provides educational and support services for survivors. Former President of Ireland, Mary McAleese, described her as a woman who has changed the course of history through her voluntary effort. In 2010 she was selected as Irish Volunteer of the Year and went on to be awarded the title “European Volunteer of the Year” on International Volunteer Day. Valerie has become the recognisable face of Irish expertise and innovation on the international children’s literature circuit. She has been a founder member of and held high office in most of the important professional bodies pertaining to children’s literature, both nationally and internationally. She has published widely in her own area of expertise, and has played a key role as facilitator and promoter of children’s authors and illustrators. Recently retired as Librarian and lecturer in the Church of Ireland College of Education, she played the key role in building up and archiving their collection, and in developing the relationship between this collection and our own Pollard collection and cognate collections internationally. Sam Shepard is one of the most influential figures in world drama, with an extraordinary body of work to his name which has inspired a generation of writers, filmmakers and theatre practitioners the world over. A relentless experimenter with form and structure, few American playwrights have exerted as much influence on the contemporary stage. Not only playwright, but also screenwriter, author of short stories, actor, and director, he is the recipient of many awards. He has a deep connection to Irish theatre, expressed recently in an intensive artistic collaboration with the Abbey Theatre. On the occasion of the award of an Honorary Litt D, Dame Lynne Brindley, DBE, FRSA, ex- Chief Executive of the British Library and visiting Professor of Knowledge Management at the University of Leeds, gave a lecture on ‘Challenges and opportunities for Research Libraries’ at 11.00am on Friday 7th December in the Neill/Hoey Lecture Theatre, Long Room Hub Building. The School of English hosted a reading by renowned actor and playwright Sam Shepard on Thursday 6th December at 7.00 pm in the Edmund Burke Theatre. 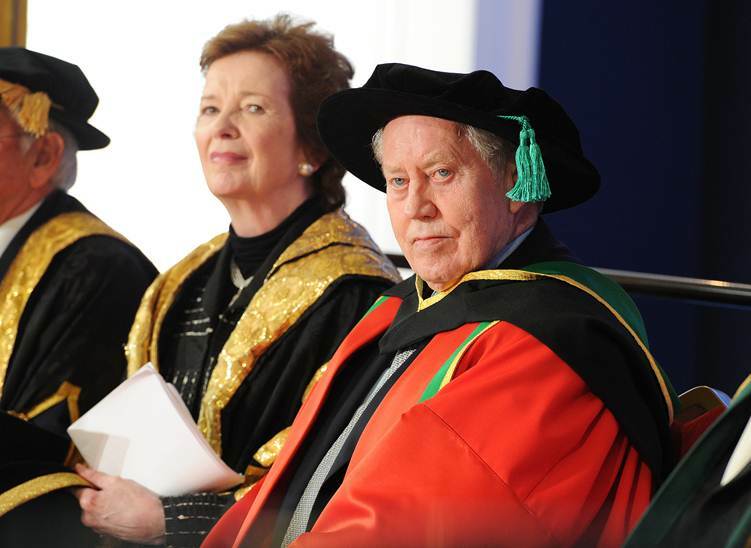 The nine universities in Ireland, North and South, jointly conferred an honorary Doctorate of Laws (LL.D) on Charles F. "Chuck" Feeney, founder of The Atlantic Philanthropies on 6 September 2012 for his philanthropic activities and remarkable contribution to Irish society, in particular to the universities. This is the first time such an honour was conferred jointly by all the universities. Chuck Feeney's philanthropic purpose in Ireland has been to create a brighter future and a better society for the people of Ireland. He believes that one way to achieve this is to enable Ireland to become a full participant in the knowledge society and to compete in the knowledge economy. 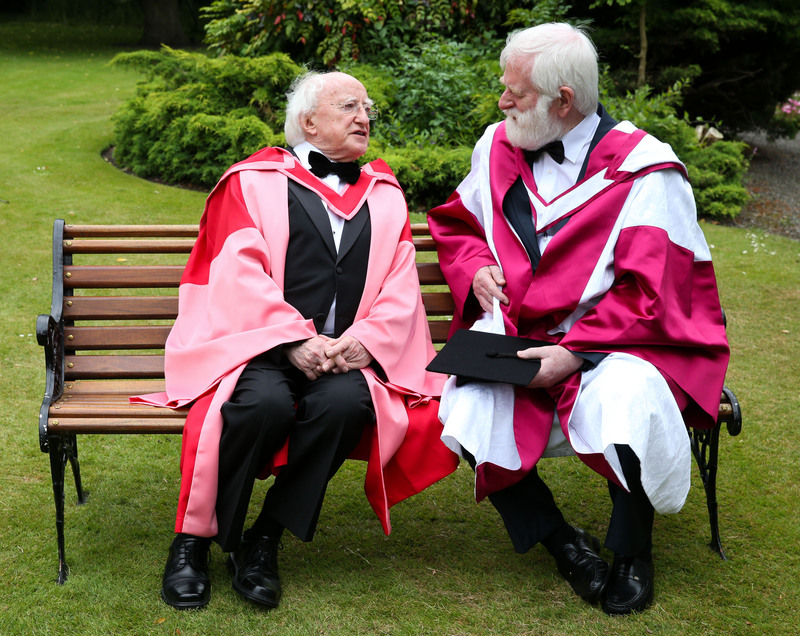 The Atlantic Philanthropies, which he founded in 1982, identified Irish universities, which of their nature are devoted to the transmission of knowledge and the generation of new knowledge, as institutions central to this purpose. Since 1989, Atlantic has donated almost €800 million to Irish universities, North and South. The physical manifestations of this philanthropy can be seen today most notably in the transformational research infrastructure which has been created on university campuses. This is providing a new generation of researchers with facilities their predecessors could only dream about. Human capital development in the universities had been supported through endowed chairs, scholarships and other forms of student support. University projects have also included support for new libraries and student on-campus housing and projects in the fields of health and ageing. In the longer term, the impact of the funding provided by Atlantic can be expected to be even more significant. Last updated 30 January 2019 by registrar@tcd.ie.